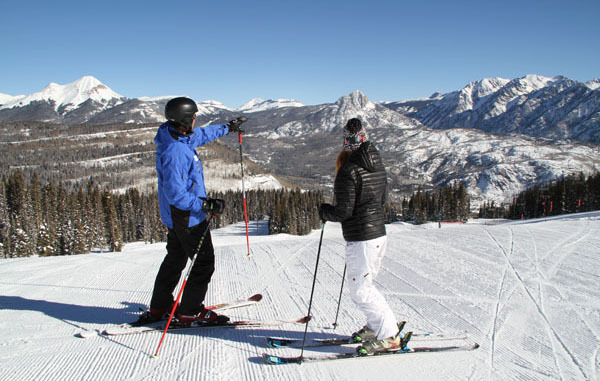 Purgatory Mountain Resort at Durango is a super friendly south west Colorado ski resort, one of the best family ski resorts in Colorado. Purgatory has a convenient ski base with a small pedestrian village and great lodging just steps from the slopes and the skiing suits every ability – with plenty of terrain for a Colorado family ski week. Did we mention the scenery is superb, with towering Engineer Peak and The Needles? The ski slopes on Purgatory Mountain are fun and playful, starting with the six pack lift, The Purgatory Village Express, from the base that serves dozens of great groomed undulating blues and greens, all with extraordinary views. Purgatory Mountain peaks at 11,822’ and the ski terrain sprawls across 1,525 acres with 11 lifts flanking the Front and Back sides, as you ski East to West on 92 trails. Purgatory is perfect for families with its forgiving fun terrain, and just enough steep pitches and glades to get your heart thumping. Purgatory’s steep Styx – far skiers right, Bull Run, and the new glades like McComacks’ far skiers left off the new Legends Lift 8 quad are plenty for the steep, deep and powder lovers. Let’s be honest, you really don’t need triple black diamonds or hike to ski terrain for a great family ski trip. The locals say at 11,822’ Purgatory Mountain, the next stop is heaven. Modern lifts like the Purgatory Village six-pack and Hermosa Park Quad rarely see a lift line. The groomers do their job nightly making white carpet on the majority of trails, leaving a few au natural with islands of grand pines between soft powdery snow. Each trail at Durango is unique, undulating with dips and knolls on soft dry Colorado snow. Kids will love Purgatory’s terrain parks, and little ones will insist on skiing the Animas City Adventure Park – a ski through frontier town on snow– a perfect family photos opportunity – next year’s Christmas card! Durango is one of the friendliest ski resorts we have encounters, its affordable, has an and excellent ski and ride school, plus on mountain daycare, ski shops and necessities right at the base, and plenty of fun family après ski activities like tubing, dog sledding, horse-drawn sleigh rides, and 18 km of Nordic ski trails. Be sure to lunch at Dante’s Backside Bistro for sit down table service, a great Colorado tapas style menu, and amazing views of the surrounding San Juan 14,000-footers, Engineer Peak, and The Needles. Staying at Durango Mountain Resort is a great value, much less expensive than nearby resort of Telluride or Vail Resort for example. Durango Mountain Resort has a nice manageable ski village plaza, a few good shops and bars like Purgy’s and the Beach. The best family lodging at Purgatory is The Purgatory Lodge, opened in 2008 – steps from slopes with spacious one to four bedroom suites all styled in rich Rocky Mountain décor with fireplaces, full kitchens and living rooms, and scenic balconies. Included in your Purgatory Lodge ski and stay package is Continental breakfast in the lovely private Mountain Club Room, and use of the outdoor pool (kids will love the slide)and Jacuzzi (parents will love the slope view), the Game Room, fitness center, and enclosed heated parking. Après ski and for dinner, The Mountain Club Room is open exclusively for Purgatory Lodge guests and members, or you can walk to Purgy’s or a few other restaurants and cafes in the Durango Mountain Village. Take the family to Downtown Durango some afternoon or evening (a half hour drive), to see this western cowboy and miners’ town which is home to over 100 restaurants, and enough cool shops, boutiques, and art galleries to occupy a non-skier on Main Avenue. Ken and Sue’s is one of the best Durango restaurant – delicious local cuisine at a bargain compared to most ski resort restaurants. Trip Advisor named Durango Mountain Resort the best value ski resort. You can stay at a Durango chain motel for short money, but we recommend you stay on mountain at The Purgatory Lodge in a spacious condo suite with a ski and stay deal, often including ski lessons, a better value and a better location for first and last chair.